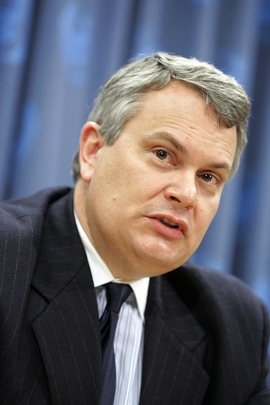 UNITED NATIONS, July 10 -- While talks about Honduras hosted in Costa Rica appeared to fail, in New York UN General Assembly President Manuel d'Escoto Brockmann told the Press the problem will be solved "soon... probably in less than a week." Inner City Press asked if the solution might involve early elections. D'Escoto Brockmann responded indignantly, "Only in the mind of someone who doesn't understand democracy. Early elections? Why? There should be early incarceration... of those who perpetrated such a crime" Video here, from Minute 35:40. Inner City Press asked d'Escoto Brockman about the Hugo Chavez-provided plane he and Zelaya flew toward Honduras in, and about reports that Chavez paid for the ballot materials for Zelaya's abortive referendum then opinion poll. While D'Escoto had been speaking about sovereignty, who did the concept apply to accepting so much help from a foreign leader? Video here, from Minute 30:50. D'Escoto Brockmann began by saying, "to be frank, I never knew where the plane was from, I was wondering while on it, if it was a plane they rented, maybe it was." But the plane was a Falcon 50 owned by Venezuelan state oil company CITGO, tail number N285CP. 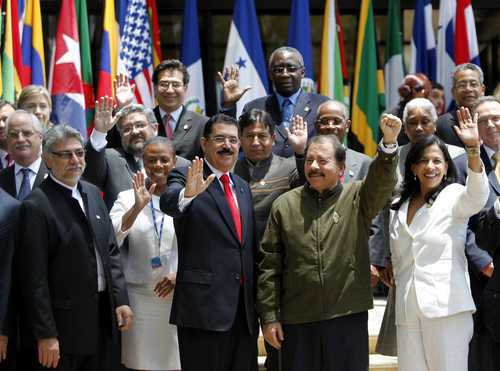 It listed San Salvador as it destination, but veered off to Honduras, "from the south," d'Escoto said. Then, running out of fuel, it went to Managua. 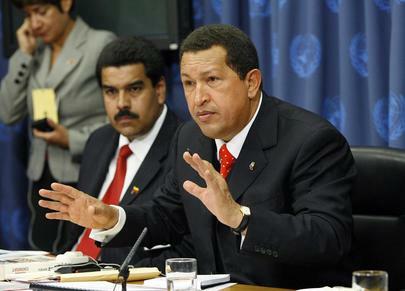 D'Escoto answered by saying that Chavez is one of the "main promoters of Latin American union... sure he is critical of some U.S. policies, but so is Obama!" He went on to say that no one should dictate "who our friends are," that the U.S. is friends Israel and "we are friends with Chavez." But in terms of sovereignty, what would he say to a Honduran citizen who objected to his government accepting ballot materials and plane flights from a foreign country? The press conference moved on to bragging about the GA's financial crisis summit. Afterwards reporters tried to square Chavez' denunciation of the Costa Rica negotiation as "dead" with d'Escoto Brockmann's hope to the contrary. Financial footnote: Inner City Press asked, but again was not answered, for a simple presentation of how much UN money d'Escoto Brockmann's office has spent. The question will continue to be asked until it is answered. It is understood that the Office of Internal Oversight Services is "looking into" its jurisdiction of the PGA's Office, presumably including hiring fairness and nepotism. Watch this site. 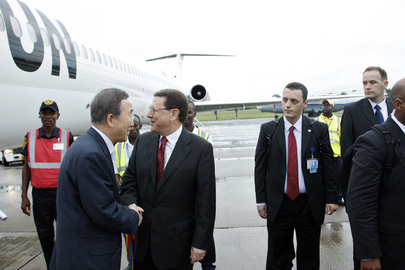 UNITED NATIONS, July 6 -- Venezuela's Hugo Chavez provided the plane on which Manuel Zelaya and UN General Assembly President Miguel d'Escoto Brockmann flew July 5 over Tegucigalpa, d'Escoto Brockmann's spokesman Enrique Yeves confirmed to Inner City Press on July 6. Brockmann's return from his native Nicaragua to brief the General Assembly in New York will be paid "from the President's budget," Yeves said, adding that the PGA's budget is "audited by external and internal auditors like everything else at the UN." Video here, from Minute 17:44. Now that it is confirmed that Chavez provided the plane to Zelaya and presumably paid for jet fuel, the extent of his support and control in Honduras is worth re-examining. 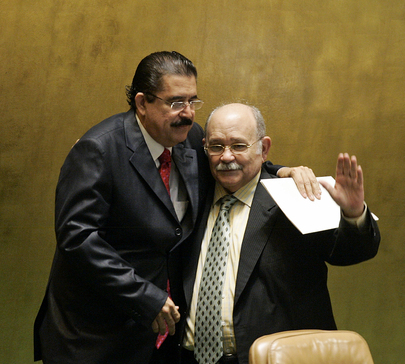 As noted, Zelaya refused to provide the Honduran parliament with his budget in September 2008. After the Honduras Supreme Court ruled that Zelaya could not hold a flash referendum removing presidential term limits, it has been reported that the referendum -- or "opinion poll" -- materials were prepared and paid for by Chavez. LAT: If President Ahmadinejad comes to the U.N. General Assembly in September as the elected president of Iran, will you acknowledge his election as legitimate? 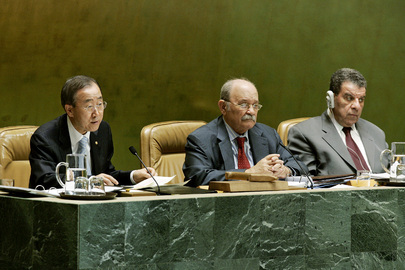 BKM: It's up to the member states who should represent their country. If he comes as president of Iran, I'm ready to meet with him again and discuss all matters. By that logic, once Honduras' Supreme Court ruled it legal that Zelaya be replaced by Micheletti, Ban and the UN Secretariat would have deferred to the country's highest court. But getting a sense of the political winds, Ban applied a different test. Either test can be defended, but a double standard can't. Or hasn't. Back at the UN, D'Escoto Brockmann refused to defend his use of UN funds to hire two relatives. After that, his spokesman Enrique Yeves refused to answer, or even listen to, Inner City Press' question about how much of the PGA's Office's $280,000 budget from the UN has been spent. Several correspondents at the UN say the amount has nearly or entirely all been spent. Has it been replenished? 1B.10 In order to enhance further the ability of the President of the General Assembly to discharge his responsibilities, it is proposed that the budget include a sum of $250,000 for each year of the biennium to supplement the level of support currently provided. Consultations would be held with each President of the Assembly to determine the way in which these funds would be used to enhance support for his/her Office. Given this, can the funds be used without explanation to hire relatives? Are the funds in fact subject to audit by the UN Board of Auditors and investigation by the UN Office of Internal Oversight Services? These are transparency and accountability questions, like the "how much has been spent" question which has still not been answered. Watch this site.